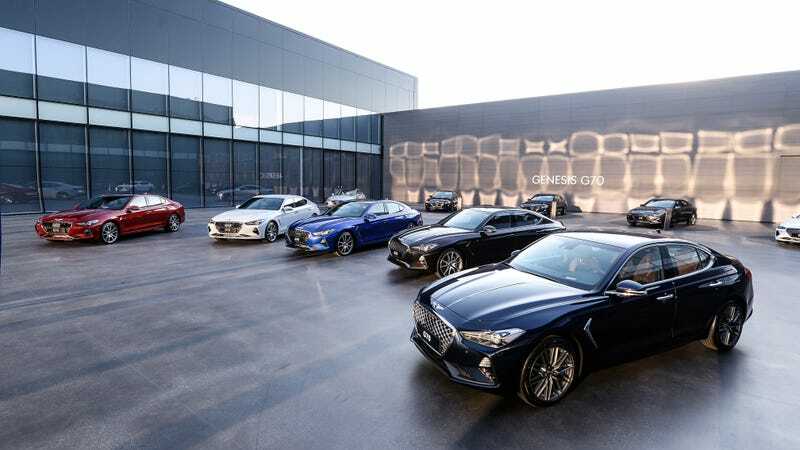 Genesis debuted in the U.S. as a separate nameplate in 2016 with the G80 and G90, before unleashing the G70 late last year as they began an aggressive challenge to established rivals like Audi and BMW. On Thursday, Consumer Reports, named Genesis the top brand in the U.S., ahead of Audi, BMW, and everyone else. Genesis is Hyundai’s attempt at taking on those German luxury brands, much as Lexus has been successful in clawing into the luxury market for Toyota. And while Genesis’s long-term success is still TBD, the early signs are promising, which is pretty remarkable considering that it wasn’t 20 years ago when Hyundai’s quality was a sad joke in the U.S. The full top ten, in order, was Genesis, Audi, BMW, Lexus, Porsche, Kia, Subaru, Tesla, Honda, and Toyota. You’ll notice in the top ten that only one American automaker—Tesla—made it. In fairness to its foes, the Genesis brand had only two models — the G80 and G90 sedans — up for review by the magazine, while Audi and BMW each fielded eight. Still, Genesis’s win reflects steady improvement by Korean automakers over the years, first in the arena of reliability and fuel economy, and now in performance and luxury features, according to Jake Fisher, the magazine’s director of auto testing. Consumer Reports’ full rankings can be seen here. A few interesting things, as Bloomberg points out: a Tesla was not named the best green car, with a Chevy Bolt taking the spot instead, while Toyota excelled in individual categories, with four of its vehicles winning best-of titles. The Audi A4 won in the luxury compact car category, confirming what I’ve thought since 1994, that I would someday like to own an Audi A4.